Isn't this just the cutest! 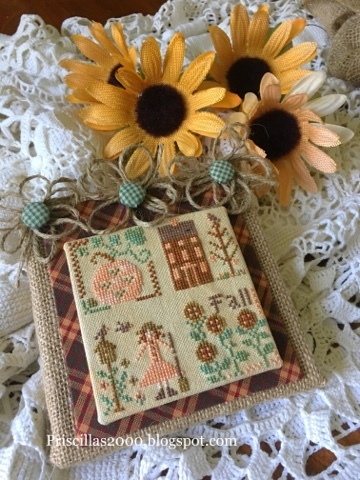 It is Fall Squared from Little House Needleworks.. These are the colors I used ,I think only the green was changed .. its stitched on 28 count tea/coffee dyed evenweave.. to finish it I mounted it on sticky board..then mounted a piece of homespun plaid on another piece of sticky board.. glued those together and then attached them to this burlap frame that I had purchased at Walmart a couple years ago.. I made 3 flowers from twine and covered 3 buttons.. getting excited to decorate for Fall! So clever!! I still need to get brave and try the cloth tea dying. Maybe you could give us some tips on your FlossTube videos - those are so great! 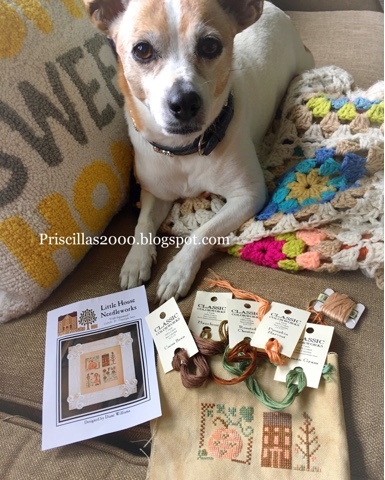 Way to go, Priscilla! It looks fabulous. I really like your twine/covered button flowers. where do you get your sheet metal and how do you cut it? 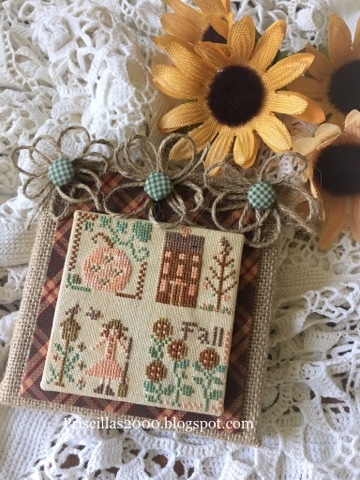 I'm getting so ready for Fall. We have heat and smoke from fires in BC. Just horrible air quality. Your little piece is refreshing!! Such a darling finsh! Will have to remember those twine flowers--they are so cute!